LUMBER + GRACE: HAIR CUTTERY'S SHARE-A-HAIRCUT PROGRAM -- REACHING OUT TO VETERANS THIS YEAR! HAIR CUTTERY'S SHARE-A-HAIRCUT PROGRAM -- REACHING OUT TO VETERANS THIS YEAR! In my (admitted totally and completely biased due to being a military spouse) opinion, there is not enough focus or recognition on the men and women who fight for our freedoms. I don't know anyone that deserves it more than someone willing to lay their life on the line for any given American citizen. With Veterans Day fast approaching, it is so refreshing and heart-warming to hear of companies giving a free meal to veterans, a discount on a service or product, etc.. Such a small gesture to show the gratitude that they so greatly deserve. 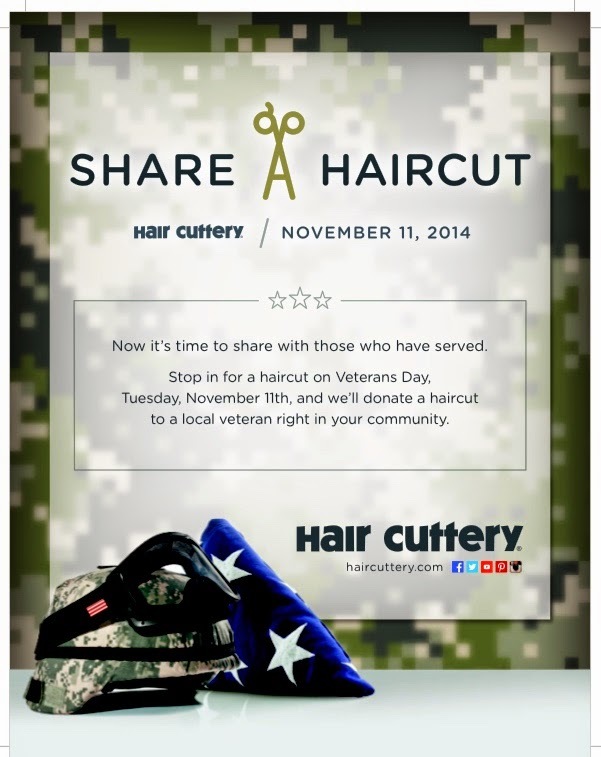 I'm excited to share that Hair Cuttery and their Share-A-Haircut campaign is reaching out to veterans this month! What is the Share-A-Haircut program? The Share-a-Haircut program was created by Hair Cuttery to give free haircuts to underprivileged community members, specifically kids in need as they head back-to-school. Since then, they’ve expanded the program to touch people of all ages. In its 15th year, Hair Cuttery is proud to say that the program has reached more than 1,000,000 children and adults in need through haircut certificate donations, valued at more than $13.5 million! How does the Share-A-Haircut program work this Veterans Day? For every adult haircut purchased on Tuesday, Nov. 11, a free haircut certificate will be donated back to a veteran in need, right there in communities local to Hair Cuttery’s almost 900 locations. How will the Veterans receive their free haircuts? In each market, Hair Cuttery will partner with local veterans’ organizations to teach those in need through the donation of haircut certificates. How many Veterans does Hair Cuttery hope to reach this year? Hair Cuttery hopes to reach 25,000 veterans this year! Where can I find the closest Hair Cuttery? By using the salon locator, which you may access here! Keep up with Hair Cuttery on Facebook and Twitter at @HairCuttery. Hair Cuttery is the largest family owned and operated chain of hair salons in the country, with nearly 900 company-owned locations on the East Coast, and in New England and the Midwest. A full-service, value-priced salon, Hair Cuttery offers a full complement of cuts and styling, coloring, waxing and texturizing services with no appointment necessary, as well as a full line of professional hair care products. Hair Cuttery is a division of Ratner Companies, based in Vienna, VA.
*Compensation for this post was provided by Hair Cuttery. Opinions expressed here are my own. Great program! I agree that those who serve our country do not get enough recognition. How amazing! I've got to find my local Hair Cuttery! Definitely want to participate in this! This sounds like a great program! We are thinking about getting my son his first haircut. I wonder if Hair cuttery does toddler hair? I would love for him to participate. What a fantastic program!!!! Love seeing things like this!!!! I'm also participating in spreading the word! This is such an awesome program and I look forward to seeing them make their goal!